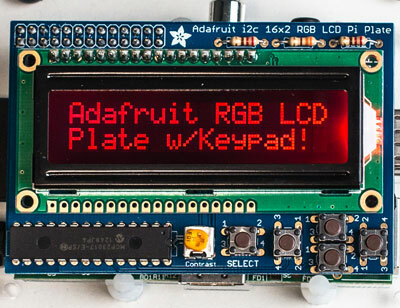 The Adafruit RGB LCD plate is a nice little display which adds 5 push-buttons to the display board, and sits on-top of the Raspberry Pi. The RGB part refers to the backlight – which, as you’ve guessed can be set to various colours by combining the red, green and blue backlights. I chose it to use as a bit of a test-bed to make sure that one of the existing devLibs – the LCD character driver should work not only with the Pi’s on-board GPIO, but through a GPIO expander chip – the Adafruit display uses the MCP23017 I2C GPIO expander chip. It comes as a kit to be soldered and there weren’t any real issues – although the one thing that I find annoying was that the holes in the PCB for the 3 resistors were slightly wider than the resistor with the legs bent close to it – necessitating some small adjustments! A minor niggle though. So with that in-mind, a quick modification to my existing lcd.c test program and it was running almost immediately without any hitches. I consulted the schematic to work out the pin assignments on the device – the display is connected up on 4-bit mode and the display control signals, buttons, and the LED outputs taking up almost all the other 16 GPIO pins. Next, a quick modification to my existing lcd.c test program and it was running almost immediately without any hitches. That’s enough to get the display going, but we really need to turn the backlight on and put the button pins into input mode with the internal pull-ups enabled – the buttons short to 0v. (it could probably be done better and with some debouncing, but for this little demo, that’s more than sufficient – demonstrating that a simple digitalRead() function call is all you need to read the button via wiringPi which has the mcp23017 registered with it). The demo program uses the up/down buttons to cycle through the LED colours – from Off to Red, Green, Yellow, Blue, Purple, Cyan and finally White. 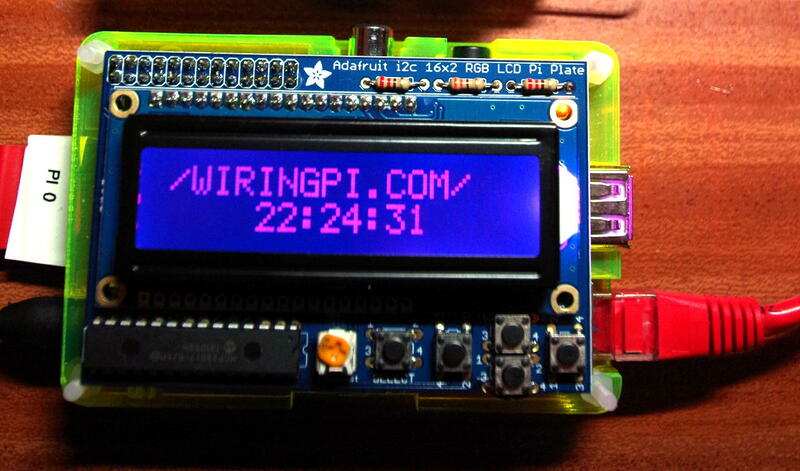 The Adafruit LDC plate on a Raspberry Pi in 5/8th of a Pibow case.